Are you interested in space, and what’s out there? Fancy investigating strange new worlds? Want to find out about alien life and where scientists think we may find it? Like to learn some skills all astronauts need to know? Astronaut Crew is an amazing new project giving kids from 8-11 the chance to explore the cosmos and learn to be a part of a team. Mission control is in a secret Space-Dock (cunningly disguised as a community centre in leafy Rotherhithe – a place many adventurers have left from and returned to). The Astronaut Crew Team have decades of experience training young people and adults in London, UK, USA, Europe and Australia, and are delighted to be touching down in London again. We’ve worked in schools, youth programmes, residential science projects, museum and businesses all over the world. With backgrounds in science, technology, maths, engineering, sport, and art they will be running an ever-changing programme of creative and exciting activities to keep the most restless interplanetary explorers busy! What Does Astronaut Crew Do For Kids? Astronaut Crew helps kids learn new skills, meet new people, and builds their confidence and curiosity in a fast, fun, friendly, environment. The main goal is teaching kids that they can reach for the stars! 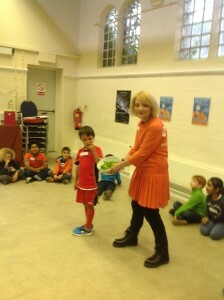 Astronaut Crew London was started in 2011 by Frances Timlin in Greenwich on 12 April 2011. It was the 50th Anniversary of Yuri Gagarin becoming the first person to go into space. She had heard something about this on the BBC World Service and when she got into her office mentioned it to Shaun Williams and Alice Piludu and together they decided to start their own voyage into the unknown. They were all used to training people from the biggest businesses in London, nationally and Internationally and decided to put their experience into working with young people who love space. They all loved science and adventurers and were used to working with children as teachers in schools, colleges and youth groups. One of the first missions was to talk to people at the British Council and suggest the statue of Yuri Gagarin they had in the The Mall should be brought to Greenwich and it was. You can see it today outside the café at The Planetarium. It was then they started working with schools and individuals using their own vast knowledge and enthusiasm. They are lucky to have been involved with NASA, European Space Agency, UK Space, RHS , The Science Museum and the London Planetarium. We are delighted to be bringing ACL Mission Control to Time and Talents in Rotherhithe in 2017.